Darkness. The absenec of light. Mankind has feared it since the beginning of time. That is because on some level we have always known it has always been there, ready to devour anything that crosses its path. Creating monsters out of men, feeding on our despair. Cyclical, eternal and undeniable. This is the Dark Soul, a supplement for the Mutant Chronicles roleplaying game. The Apostles: How do they interact and what are the Aspostles truly? Discover their internal rivalry and their ancient hierachy. Legions: Each Apostle has its own legions, even its own Malignants. Learn of them all and what purpose they serve and the powers they wield. Heretics: Do they all commit evil acts just for the sake of it or are there still twisted human emotions governing them? Learn what it is to become a heretic and what drirves them. Powers Each Apostle bestows its worshippers with unique powers. Study them in depth and the price that comes by wielding them. All heretics can be struck by the dreaded stimata and degeneration. Technology: The Dark Technology, over which Algeroth rules, is the hammer swung by the Apostles, crushing all hope from mankind. Discover intricate new weapons, equipment and the corruption they bring. 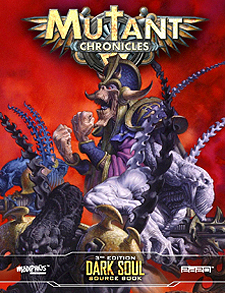 Dark Soul requires the Mutnt Chronicles 3rd Editon Rolelaying game.